You ever change what you're cooking in mid stream? I did the other night. I had a lovely sirloin steak that had been thawed a couple of days and needed to be cooked. I just didn't want grilled steak and salad, however good that might be, I wanted something different. 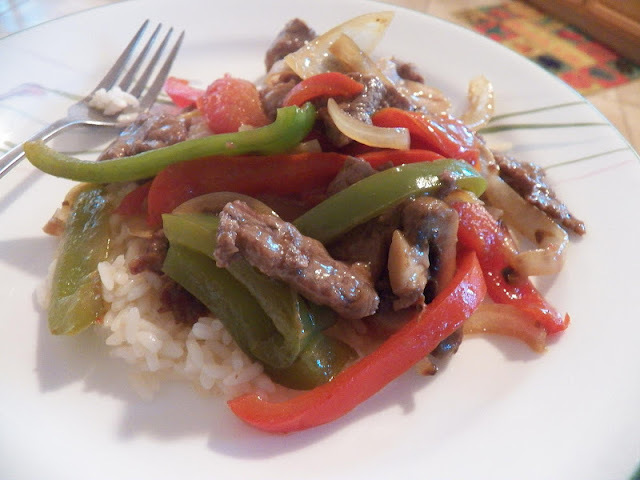 And as I pondered the steak, I realized I had a couple of peppers in the fridge that needed to be eaten, and I thought Fajita's!!! I'm always up for something Mexican. 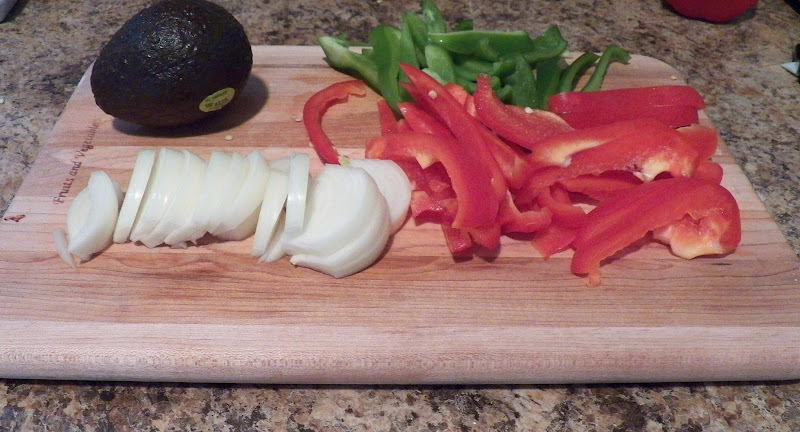 So I get the peppers out, slice them, slice an onion, get out the avocado, take a picture of them sitting so pretty on the cutting board. After taste testing a couple of green pepper strips that is. You have to make sure of your produce, it has to taste right. Then as I got my stuff together, sorta, I got interrupted a couple of times, and I realized what I really wanted was something vaguely Chinese. Actually I got the idea as I was slicing the meat, and getting interrupted a couple of times, while doing so and forgot to take pictures, grrrrrr. So imagine me slicing the steak on an angle in thin slices. 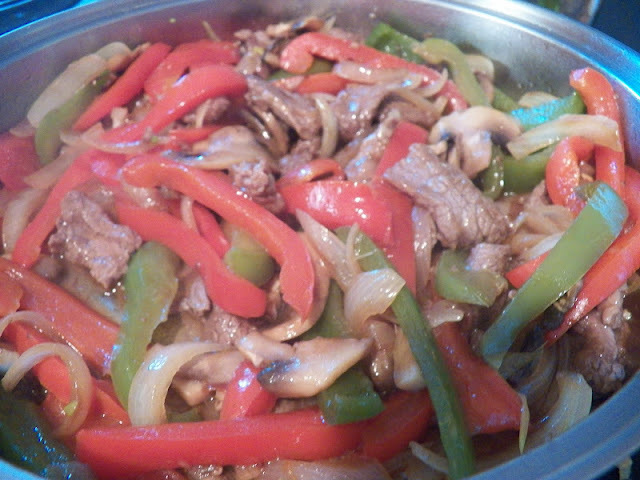 Then imagine me dumping a tablespoon of cornstarch over the beef and mixing it together while I'm sauteeing the peppers and onions. (this is a neat trick by the way, it tenderizes the meat a little, giggle) I also added a thinly sliced garlic clove to the mixture. And some of the mushrooms that were hiding in the fridge, they thought they could escape, but I found them, sorry, it was a long week and I'm feeling a little silly here. At any rate, I finished it off with a splash of soy sauce and a few drops of sesame oil and served it over a bed of rice. I had such a good dinner. Such a simple meal, but tasty. And if I'd wanted to I could have made this into fajita's by omitting the soy sauce and sesame oil, and adding a sliced jalapeno or three, and sauteed them all together and stuffed into a flour tortilla. With the aforementioned avocado and some cheese as well. OK, I know you're not supposed to put cheese on fajita's but I think cheese goes with everything. Now to go and clean house and get ready for Tapa's night. I've got something in mind for that, just have to get it all together, and yes, I will take pictures. In fact I'm going to go and change the batteries in the camera right now so I can do my thing.